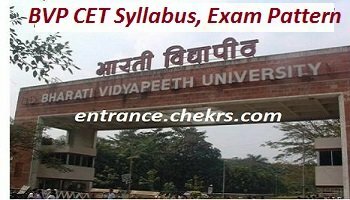 BVP CET Syllabus, Exam Pattern (बीवीपी सीईटी सिलेबस, परीक्षा पैटर्न) 2018: Candidates who are looking for most effective syllabus and exam pattern of Bharati Vidyapeeth Common Entrance Test 2018 will be able to check the topic wise syllabus of all subjects that are included. Candidates will be able to prepare a proper study plan only after getting aware of the exam pattern and syllabus, So you are advised to follow the updated and latest syllabus for BVP CET 2018 that is given below. The candidates can also check the BVP CET Exam Pattern 2018 online here. Only the selected candidates will be able to get admission in the Bharati Vidyapeeth University for pursuing their engineering studies, so the candidates need to pass the BVP CET cutoff. We are here to make you available with subject wise Syllabus of BVP CET 2018 which will be very useful for you to get success in qualifying the Bharati Vidhyapeeth Common entrance Test. The questions that are asked in the BVP B.Tech entrance exam are based on the 10+2 level syllabus of Physics and Mathematics. We have covered separate Syllabus for Physics and Mathematics, you are advised to go through the updated BVP CET B.Tech Syllabus 2017 in practice to score better marks in the BVP Engineering Entrance Exam. If we talk about the BVP CET B.Tech Entrance Exam Pattern 2018 then we want to conclude that there are total 200 question will be asked from Physics and Maths, 100 questions from each subject. Each question carries 01 mark and the total duration provided for solving these 200 questions is 180 minutes (i.e. 03 Hours). Each question will be of 01 mark, i.e. 200 questions = 200 marks. There will be no negative marking for any wrong answer. The question paper will be provided in English language only. For getting selected in BVP classroom engineering courses, applicants need to qualify the BVP CET and then the selected candidates who qualify the BVP CET Cutoff, they will be called for BVP CET Counselling. The seats in the university will be allotted to the candidates as per the choices filled in the counselling form and the BVP CET merit list . Approx 700 seats are available for enrolling new students in various B.Tech streams, so the first 700 candidates who score highest marks will be allotted the seats in Bharati Vidyapeeth University. It is very necessary for all the applicants to become familiar with all the complete syllabus and exam pattern of BVP B.Tech Entrance Exam 2018. Candidates will get to know about the type of questions that are asked from different sections and weight of all these sections from which the questions will be asked in the examination. You can check the examination mode, no of questions, total marks, the time duration of paper, marking scheme and other important news. The questions that are included in the BVP B.Tech Entrance Exam Syllabus 2018 are asked from 10+2 standard physics and maths. You can check detailed BVP CET Syllabus 2018 from the information above or you may contact us by leaving your comments at the end of the post, we will respond you as soon as possible.